Primary Target: Global brand for kids aged 4 – 7. These are the official Monty licensed characters, Monty. Monty is a music fan, with each episode of Kazoops containing an original song. For bookings where there is a musical element, hiring a Kazoops Monty character can really help to keep little ones engaged. Kids will love meeting Monty, a friendly, outgoing character who is normally accompanied by his best friend and pet pig, Jimmy Jones (not available for hire). Children can have photos taken with and spend time alongside our professional performers who have been trained to stay in character when in costume. 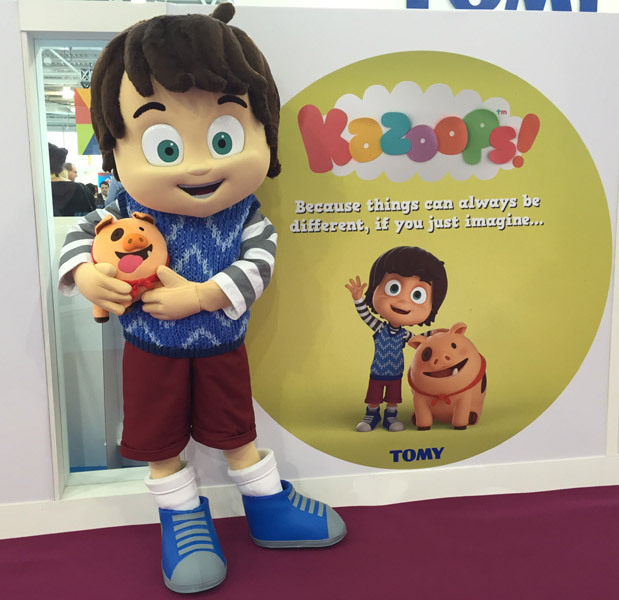 This allows kids to have the most authentic experience possible when meeting a Kazoops mascot, and as all of our performers are accompanied by a minder to ensure they remain in character, event organisers can have confidence that they will be on-brand for the duration of the appearance. While some costume hire agencies may supply only the attire itself, at Rainbow Productions, we specialise in sending out trained professionals costume to protect the brand. 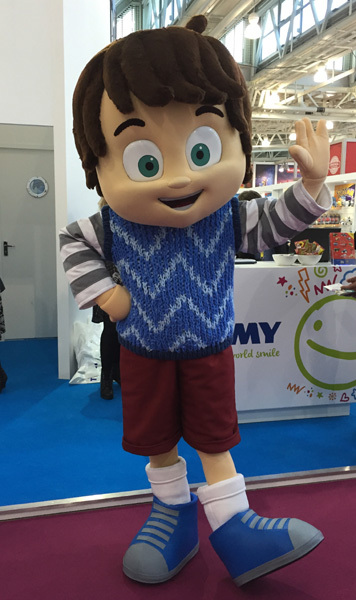 Visitors to your exhibition or event can have the experience of actually meeting and greeting characters, which can create lasting happy memories. Need to raise the profile of your event? Why not have characters near to entranceways or in public spaces to attract attention from passersby? As we have over 30 years of experience in this industry, we are well placed to provide you with advice as to how to maximise the impact of hiring Kazoops characters, and we can work with your logistics team to coordinate single-day and multi-day bookings at your request. To find out more about working with us, get in touch to speak to a member of the Rainbow Productions team today. Monty is a 6 year old boy with a big imagination and a desire for adventure. He lives with his mum, dad, sister, gran and the family pet pig, Jimmy Jones. Jimmy Jones is his best friend. Monty never takes anything at face value. He is inquisitive and creative and is always questioning why things are the way they are. Who says you have to wear matching socks, or that pigs don’t dream? That you can’t change the way a story ends or that all monsters are scary! Monty says “Kazoops!” every time something makes him stop and wonder how or why. Then he closes his eyes and says “Just imagine…” which takes him and Jimmy Jones to fantastical, imaginary, musical worlds where he challenges the preconceptions he’s pondering. Sometimes his journeys lead him to understand the how’s and why’s, but most of the time Monty’s perspective will teach the grown-ups to see things in a new way. ADDITIONAL BRAND INFORMATION FOR Kazoops! Music is a main component in the show, with a unique song providing a narrative for each of Monty’s imaginary adventures, helping to challenge the preconception of that episode. The main Kazoops world and characters are animated in full CG, but the world in Monty’s imagination has 2D paper cut-out-style landscapes. Monty’s collection of toys include Jarvis the Goldfish, Betty the Yeti, Zappa the Robot, Lily the Alien, Otis the Warthog, Floyd the Flamingo and Suzy the Dinosaur. In each episode, whichever toy Monty is playing with is the toy that comes to life for his next imaginary adventure. Character costume Monty is available to attend UK events.